Loved your card! Beautiful colors! Such a great idea. Always enjoy your blog posts. Bold, bright, and beautiful - and that's just you!! Congratulations Joan, your card is gorgeous and I love your peeling paper technique - used that occasionally myself when I wanted a different look/feel! So glad I popped over to Ellen Hudson to check out your card Joan! I LOVE the pop of color on the black card base! Looks awesome! So pretty. I love how a little black makes any color pop! Amazing! I absolutely love how you can combine CAS BnW and colors in such an intricate way in all your cards - simply amazing! Such a pretty card. I started reading your story too about how stamping destoyed your life. Funny stuff! Well... I must be living under a rock because this is my first visit here! LOL Not my last to be sure. LOVE this technique!!! The black base was a great choice. Beautiful! Oh my GOODNESS Joan, your card is amazing! I love your technique and I have to try it. Congratulations on your guest spot, quite an honour! You are the best kind of guest bringing a gift like your beautiful card! I love how those bright flowers just pop on that black background - very pretty and unusual! This card is gorgeous! I know your husband is going to love it! Lovely card and genius tip to peel the watercolor paper. Fabulous tips, thanks for sharing. What a gorgeous card too! Don't you just love the creative minds of crafters? Separating thick paper to have thinner paper? Oh my.....that's genius and stunning! Oh, I love your card, Joan! What a great technique! Fab card! Using a black card base really sets it off! wonderful card Joan - wasn't sure if i needed to comment here or on your post so i did it both places. Brilliant!! You have solved the problem of too thick paper. Much appreciated! 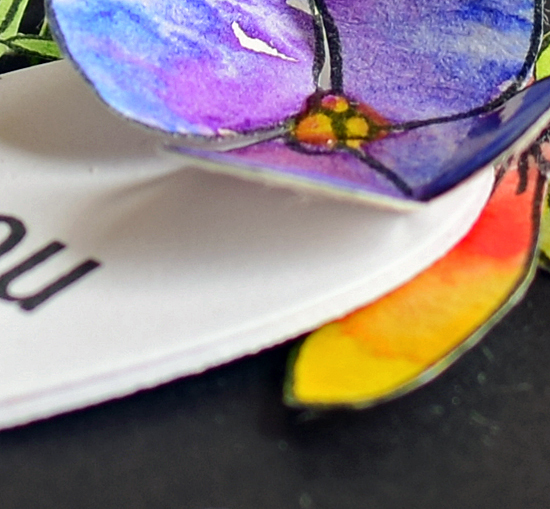 Perfect way to use those small can't throw away snippets of watercolor paper. Who knew? I didn't and now I have learned something new today. Bingo! I love it...never thought about separating the watercolor paper layers...great idea. Love your story about how "Stamping Destroyed my Life"...too funny! J.B. this is one FAN tastic card!!! Look at you go!!! Congrats - isn't life grand?! I was so happy to see you in Ellen Hutson's classroom! And what a beautiful card and technique. Thank you so much for sharing your creations and humor with us. Joan it is stunning! Great tip about separating the layers of watercolor paper -- I'm going to try that. Thank you for all your inspiration! You go, girl! so beautifuul card, thanks for the chance to win! Congratulations on being featured on the Ellen Hutson blog -- you certainly deserve it! Love your card and the technique of making delicate flowers. LOVE the vibrant colors on black..very Classy! Love the card! Can't wait to try the watercolor paper layer technique. Love that Ellen had such nice things to say about you - and you for her. And that card?!? Gorgeous! Love the tip to try separating the layers of watercolor paper - I would never have thought of that. Genius! Amazing card. I am going to try your technique! Oh how fun? Thanks for sharing your talent for prose as well as stamping. Such fun.Just now finding about your "book" and loving it . Love the vibrant colors of the flowers. Very striking against the black background. Stunning card. Thanks for sharing. I LOVE your project, Joan! The little flowers and stems make a big impact on the black card! Congrats on being featured on Ellen Hutson! Congrats for being the GD! you did a great job! I always enjoy photo tutorials and loved yours! Such a beautiful card! Joan, it's beautiful! Love the black and white with bright accents. Your technique to make the flowers sounds like fun - thanks for the great tutorial! Joan, I love the beautiful colors and dimension! What a special card! Thanks for the tutorial, and congrats to you for getting to be a guest designer at Ellen's Classroom! What a pop for your focal point - layering it all on a dark card base. Love the watercoloring to soften the starkness of a dark card. Beautiful. Joan, I must say that this project is absolutely gorgeous. I just love the vibrant colors and the dimension on the project. You were right to use the black card base in the end. I think the white would have overpowered the rest that you wanted to be the focal point. And how exciting for you to be a guest designer for Ellen! I love you and Ellen and Julie too! So what a wonderful combo! Stunning card, Joan. I love the bold pops of color with the black. I'm so glad to learn how to separate watercolor paper; such a simple solution to eliminate that thickness. Thanks for a chance to win. I love it when I learn a new technique. I'll have to try this out. Beautiful card! Your choice of a black base was brilliant. Congrats on your guest designer spot. Your card is sensational. Love the colors you used. Wow, love your beautiful card! What an awesome technique to get those delicate, gorgeous flowers, so clever! I also love how you have used several stamp sets from different companies too. Such a stunning card on that black card base, Joan! Appreciate the details on how you created this beauty. Congratulations on being at guest of Ellen's...quite the honor! My wish list there keeps growing so would be thrilled to win this GC. TFS! Your card is wonderful. thanks for the trick of separating the paper and all the other tips you gave. What a cool technique! Will have to try that! The card is stunning! Stunning and elegant - the black base really showcases the beauty and the dimension of those incredible flowers! Such a beautiful card. And such a handy tip about peeling away paper layers. I water-colored a bunch of flowers recently that will benefit from this technique. Thanks for the inspiration! very pretty! I love how the black makes everything else pop! Joan, congratulations on your well-deserved designer role at Ellen's place; your creativity is amazing (and yes, I follow you via Feedly because your talents - both in card-making and 'story' telling are too marvelous to miss)! Your card: stunning. Your tutorial: 110% user friendly (especially for someone like me who does a lot of 'huh...what to do next' when creating). Your inspiration: let's just say that a bunch of Concord and 9th products are heading to my small Canadian town! Just received the 'your order has been shipped' notification! Thank you for the enabling! I love these delicate flowers and leaves! I want to try this out--thanks for the inspiration! Thanks for sharing how you made the flowers. i never would have thought of this! congrats on your feature in the classroom! LOVE the purple/blue flowers! So gorgeous. And peeling the paper apart is a genius idea! Loved the delicacy of your flower and the black background to pop the colors. I'm also trying to find your article "Stamping Destroyed My Life" that Ellen referred to. So far, haven't succeeded but will keep looking! Sure would like to see more from you. Found it! Right at the top of this page. Delightful. Felt a little like M. Did not stop reading until I finished chapter 6 and I'm going crosseyed from sleepiness. Thx for yr writing. Will read more tomorrow. Lovely, inventive, creative, great instructions. I'm ready to give it a go! Absolutely stunning!I will definitely give this a try. Wonderful! Thank you for sharing the tip on using watercolor paper. I will try it today! I can't wait to see what all you come up with!!! Congrats! Thanks to Ellen for introducing you to us! Congrats on being the Ellen Hutson guest designer! Love your card - thanks for the tip to separate the paper layers to make elements more delicate. Congrats and pleasure to meet you! Totally signed up for your e's. ;-) Big fan of clean & simple and you make it look gorgeous! Cool idea with the paper peeling! Love the delicate texture it gives your card. Congrats on your gig! You are sure getting back into the stamping arena in full force! I remember when you were taking some time off~ probably a long time ago, but seems like yesterday :) -- Awesome GD card! Wow! That pop of color on the black card is stunning! Wow Joan - what a fascinating technique! I would never have thought to peel off the top layer of a sheet of watercolor paper!! I love it when people think 'out of the box' and then pass along fabulous results! Brilliant idea to separate the watercolor paper! I will definitely try that! Thanks for sharing this lovely card! I love when I can say "you learn something new every day". And I just said it to myself. Thanks for coming up with this idea. And sharing. And for smiles along the stamping-destroyed-my-life way. Wow, the flowers are really pretty! Love the idea of peeling off the paper. HI Joan, I hope you will not be offended but I am just being introduced to you today, for the very first time. I think I just might be addicted already to your blog...tee hee! I've just read the first chapter of your "story" and I am anxious to read the rest! I might just have to have a reading marathon today...oh my, I've just discovered my husband took the day off work....how am I gonna do this??? BTW, as I was directed to your blog from elln hutson's I also noticed you earlier posts from the week. I LOVE the way you have made the sun out of the different stamps!!! I can't wait to see more of your beautiful creations!! Wow. Nice card. So creative with the watercolor paper. Hi Joan. I checked out your site through the link from The Classroom. Just wanted to let you know that I love your cards! Also, thanks for sharing the thin paper technique at EH! What a great idea! I love your "peeled" flowers! The colors are gorgeous & the design is totally awesome. Thanks for the great tip! What a neat technique idea! I'm so glad you're the guest crafter on Ellen Hutson - I've found a fun crafty person I can follow. I guess I have been living under a rock...you are a new find today via Ellen! Thank you for this technique and some delicious reading today. So glad Ellen featured your blog and you shared this technique! Now...I must peruse your entire site because I like HUMOR! I need to started peeling paper - it sure beats peeling potatoes! I never thought of peeling layers of paper but I will do it now because your flowers are fantastic! Thanks so much for sharing your beautiful card!!! What a fantastic tutorial, Joan!! Thanks for the tips that you shared and your beautiful project! Fabulous card Joan. Great contrast with the bright flowers and black notecard. Wow, never thought of separating the watercolor paper layers. Thanks. For sharing that tip. Love the composition of your card. Beautiful! I have heard of this technique(peeling the top layer of water color paper but you demonstrated it so well. Your flowers are so delicate and beautiful. I enjoyed reading your "fiction" episode. I'm going to catch up with the other chapters later. You are so funny. Thanks for sharing on Ellen's blog. WOW - thanks for sharing this great technique. Love the pretty flowers you created !!! Congratulations! What an honor to be invited to The Classroom! I LOVE Ellen's shop, they are such wonderful people, and the quickest at getting orders out! I love your project "peek" and I'm off to see it in full!! Blessings to you!